Gannon & Benjamin Marine Railway didn’t play when it came to saving Mah Jong. The 52-foot Sparkman & Stephens-designed Mah Jong under sail off Martha’s Vineyard, Massachusetts. In February 1957, a 52-foot yawl splashed into Kowloon Harbor from the Cheoy Lee shipyard in Hong Kong. Mah Jong was the cumulative dream of three American college friends who had pooled their resources, ideas and expectations. Now that the construction was a reality, preparation for a 10-month, 15,000-mile shakedown began. Hovee Freeman of Providence, Rhode Island, was a U.S. Navy-trained navigator and accomplished sailor. Mike Merle-Smith came from an Oyster Bay, New York, sailing family that had connections in exclusive East Coast yachting circles. Gilbert M. Grosvenor of Washington, D.C., was a National Geographic photo editor and grandson of Gilbert Hovey Grosvenor, the first full-time employee and a president of the National Geographic Society. 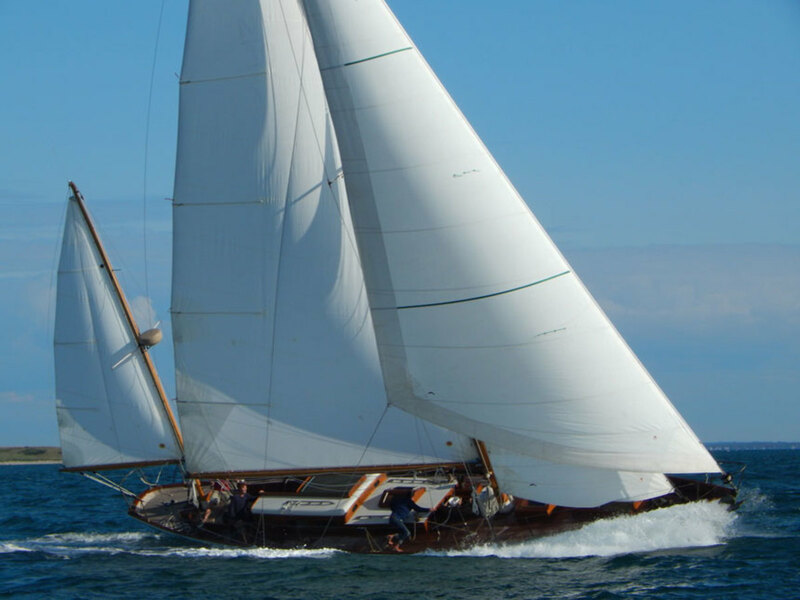 They’d acquired the plans for their yawl from the heralded yacht designers of the day: Sparkman & Stephens in New York City. A major consideration in choosing Hong Kong for the build was the cost of their enterprise and access to the finest wood known for boatbuilding at the time: Burmese teak. Mah Jong took just six months to build at a cost of $30,000. And by taking the boat’s plans halfway around the world for construction, the three men initiated groundbreaking relations with Chinese builders and craftsmen that would continue into the present, resulting in thousands of handcrafted wooden yachts. After the launch, Freeman and Merle-Smith, with their wives, sailed Mah Jong on a roundabout cruise that took them to the Suez Canal, where Grosvenor and a guide joined them and headed for the Greek islands. They idled through and around the islands for two months. Grosvenor took photos and wrote an account of the adventure that appeared in the December 1957 issue of National Geographic. He then returned to Washington, and a crew helped the others take the boat to the United States. 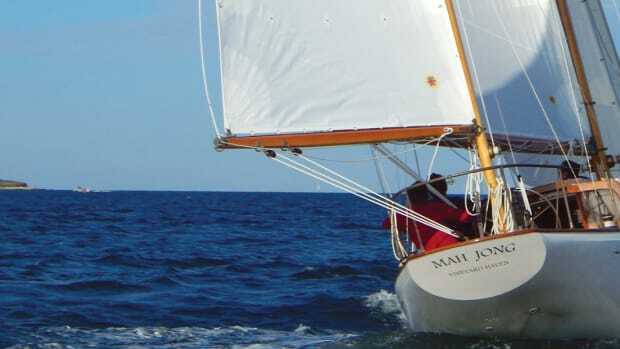 Part of the trio’s dream was to sail Mah Jong in the 1958 Newport Bermuda Race. They arrived in Narragansett Bay, Rhode Island, in December 1957 and entered. Mah Jong finished in the pack, but as with so many dreams of youth, once the goal was realized, another took its place. The three men put her up for sale. Built in China of Burmese teak, Mah Jong deserved a second chance. In 2014, just before heading out on a family cruise to the Caribbean, Ross Gannon heard about Mah Jong. She was in a state of aged underappreciation on Virgin Gorda in the British Virgin Islands. 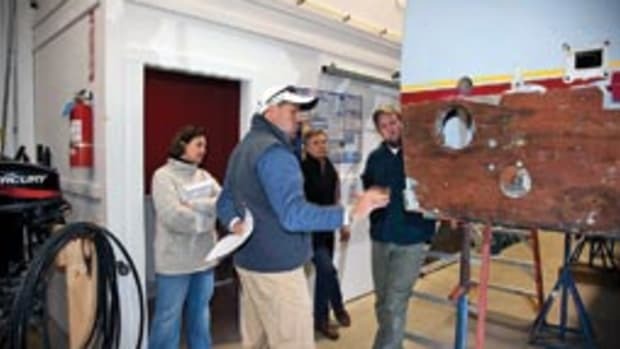 Gannon, co-founder of Gannon & Benjamin Marine Railway in Vineyard Haven, Massachusetts, had been endeavoring to find a restoration project for an interested party. 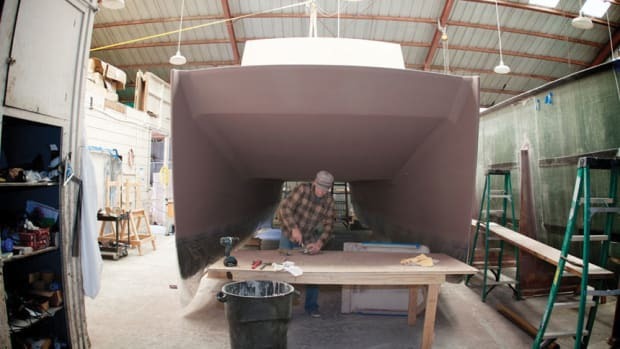 Soon there was an introduction between Mah Jong’s most recent owner — one in a long line of many since 1958 — and Pat Ilderton, a builder from Charleston, South Carolina, with an itch to restore an old yacht. Gannon did a survey and found the boat to be in less than fair shape, but as had been his lifelong wont, he was not quite able to condemn the old classic to the boneyard. As a youngster, he had seen Mah Jong in the prime of her life on a mooring in his own home port on the Connecticut coast. He advised Ilderton that the project was doable, but only as an undertaking that would go long and deep in time and resources. Then he sailed off to enjoy time in the Caribbean with his family. During the next few months, Ilderton could not let the idea go. 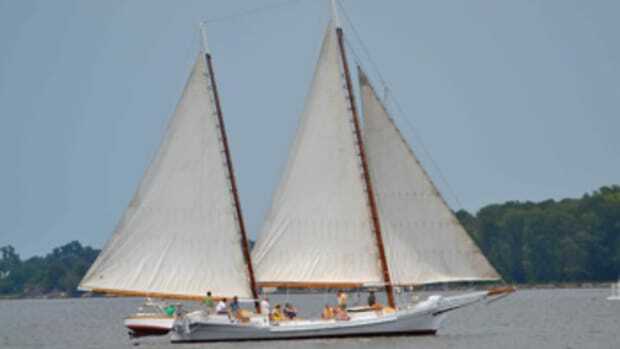 Negotiations took place for the old yawl, the yard bill was paid up, and Ilderton had her relaunched. When Gannon got the word, he was not surprised. All his life he had guided the most delusional of wooden-boat dreamers. He had rebuilt and restored some of the greatest non-floating basket cases ever to be up against the chainsaw, and many harbors up and down the Eastern Seaboard had been improved by the grace of his lifelong refusal to condemn even the most worm-eaten, hogged, stove-in, decrepit old wooden hulks. 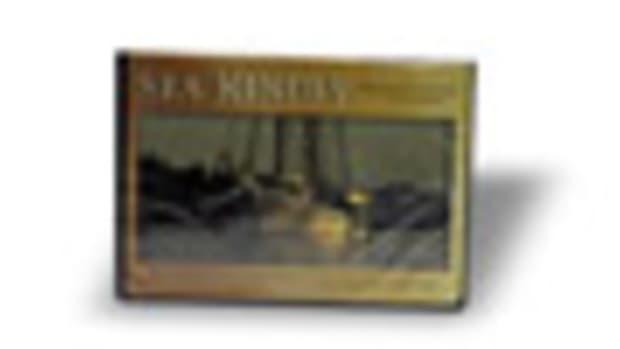 Now Mah Jong, the quintessential classic beauty of a bygone age of sail design, would find succor in the big, dusty shop of Gannon & Benjamin Marine Railway. The immediate challenge was getting her from the sun-drenched Caribbean islands to the cold-water hardscrabble coast of New England. The quality of her construction helped. When Mah Jong was refloated after years of standing on her keel on the hard, a crew was standing by with the pumps at the ready. She leaked a little around the sternpost, but that was all. 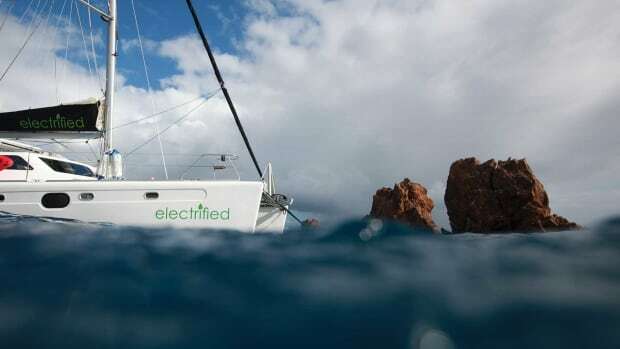 Gannon, Ilderton and the crew rigged her and sailed her to Tortola, gingerly at first, then with a little more gusto. Mah Jong again demonstrated her fortitude. Under Gannon’s supervision, she was loaded onto a yacht-transport vessel, strapped down and shipped off. Gannon and his family were still sailing north when Mah Jong was set back in the North Atlantic. 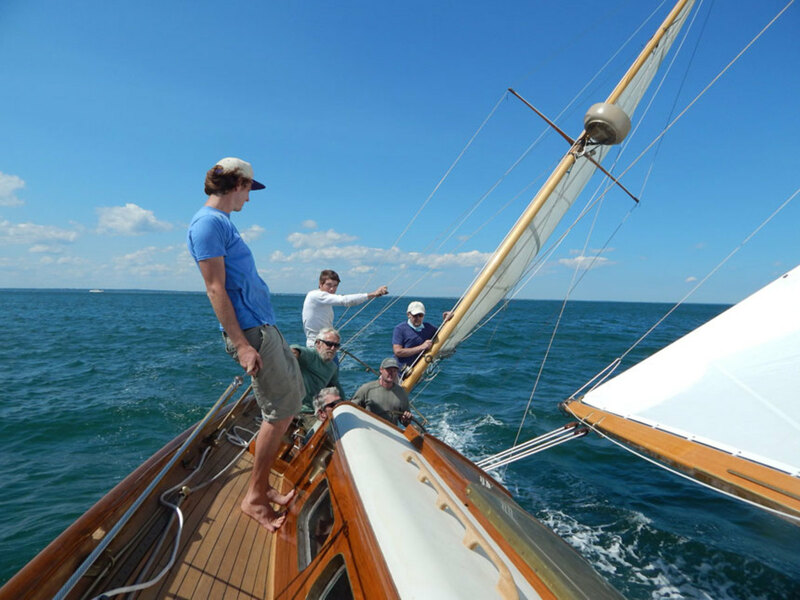 Ilderton and a crew sailed her from Newport out to Martha’s Vineyard and picked up a mooring in Vineyard Haven Harbor, where she was lying when Gannon and his family sailed in from their seven-month cruise in June 2014. 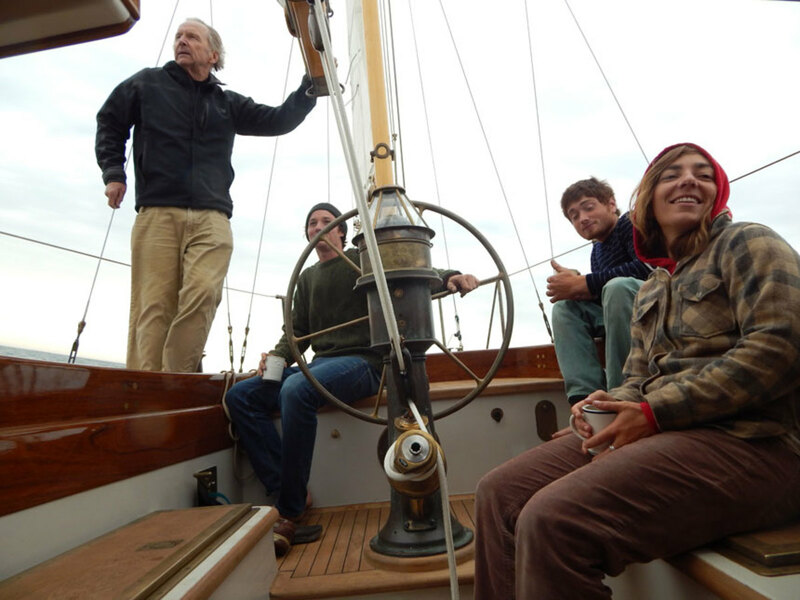 Owner Pat Ilderton enjoys an early morning on Vineyard Sound as shipwright-turned-captain Alex Goldhill and crew Zoli Clarke and Emma Thomson set Mah Jong on course for the WoodenBoat show in Mystic, Connecticut. During the busy summer season in Vineyard Haven, Mah Jong was derigged, with her main mast and boom set on horses in the otherwise empty Mugwump shop. They were stripped of all hardware, had their screw holes plugged and received coat after coat of fresh varnish. They were then hoisted to the rafters, where they hung the full length of the barn. In the harbor, meanwhile, the boat was prepared for her trip into the shed. Deck fittings, hardware and stanchions were pulled, and the house was removed right to the deck. The hatches were detached and moved to the shop too. Finally, as the traffic of the ever-lengthening shoulder season settled into the quietude of local island comings and goings, Mah Jong was lifted from the water and lowered onto a trailer. She was hauled down the middle of Beach Road and into the yard of the Mugwump shop, then carefully backed into the barn, filling the cavernous space that would be her home for several years to come. Mah Jong preparing for the long-anticipated trip from Mugwump to the water. As the days shortened and winter-storage boats were hauled into the yard, arranged rail to rail and covered, heavy work was in progress inside. Under Gannon’s practiced guidance, many processes were happening simultaneously. The decks of the second-floor surround were extended to within inches of the hull at the waterline, with Mah Jong standing on her keel in the center of the shop, allowing access for work on the bottom planking, rudder and topsides. An entire crew was dedicated to dismantling and preserving every part of the boat. This is a slow, deliberate process, much like an archaeology dig, in which every piece removed has significance as a pattern for new parts, a place reference or a reusable item. Mah Jong’s original Burmese teak, the first cut of old-growth wood, is irreplaceable in today’s lumber markets. So as the interior was unfastened and removed, its pieces were stacked against the shop’s interior walls to be reused when the time came to rebuild. As the boat came apart, buckets of bronze screws were collected. Hardware, hinges, latches, fittings and hooks — solid, but with six decades’ worth of patina and grime — were tossed into vats of diesel oil to soak. The crew, working in dust masks, vacuumed a half-century’s worth of dust as areas not seen since her build were opened, revealing the quality of the original construction and the intricacy of the joinery by the Chinese craftsmen so long ago. The winter crew was pared down to allow for the other projects around the yard. Zoli Clarke, who had been working at the yard since age 13, was now a full-time shipwright. Sara-Mae Ilderton, Pat’s daughter, worked through the chill of winter. Robert Bennett, a longtime boatbuilder, was on Mah Jong, too. By December 2014, she was dismantled and ready to rebuild. 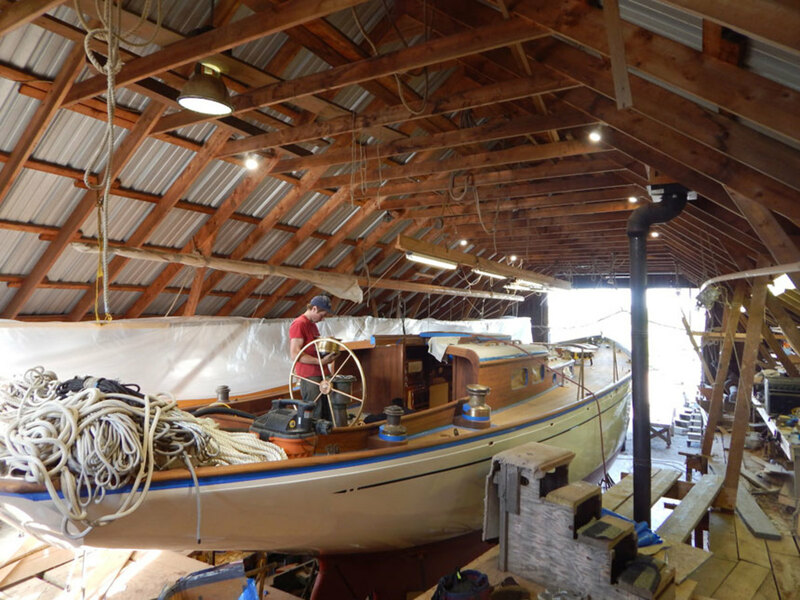 The interior work was completed as much as possible before the teak deck was laid over the new framing. In January 2015, Mah Jong started feeling the revitalization of new wood. She’d been taken down to deck beams, planking and frames that stood on the original lead ballast and keel. The deconstruction had gone further than anticipated, but Gannon had insisted on following issues until the end so a thorough rebuild could materialize. Ilderton, a builder himself, understood the process and gamely agreed. New deck beams, starting at the breast hook forward and moving aft, were replaced one by one to make sure the boat’s shape remained pure. 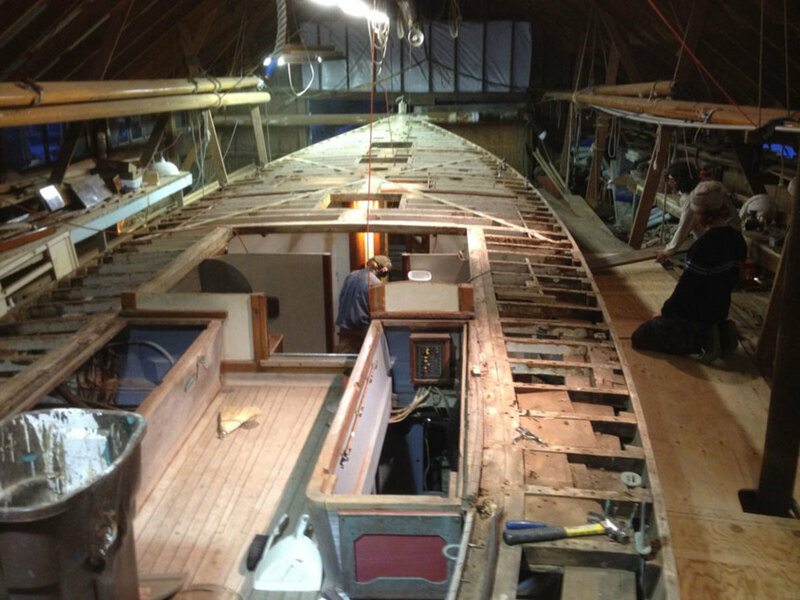 Then began the heavy work of replacing the frames and floor timbers, the structural skeleton of the boat. In sections, every other pair of frames was replaced. A new floor timber was patterned and fabricated, then bolted through the keel. Mah Jong was originally fastened with copper rivets, so the old frames needed to be sectioned and split out, and the rivets cut to remove them. The new frames were sawn from heavy 2½-inch-thick slabs of live oak. Each frame was patterned, with the bevels marked on the pattern as it changed to fit perfectly against the inside of the hull from keel to sheer. This is a slow process that requires perfect contact between plank and frame. Live oak is a stout material from giant trees that grow along the southern U.S. coast. The grain is a gnarly, convoluted, interwoven tangle that resists splitting and has no pattern or regularity. The stock was cut in 9-foot lengths, so it was necessary to cut frames in futtocks: short sections paired with overlapping sisters to each frame station. The floor timbers were fabricated from angelique, a tough, heavy, strong wood from the tropical coastal forests of Suriname, South America. In the original build, some bronze floors had been used, and these were reinstalled. The work progressed aft, picking up tempo as practice made the process gain rhythm. The work also added weight to the original build. Seaver Jones divides his time between work at the Gannon & Benjamin yard on Martha’s Vineyard, Massachusetts, and his ranch in Patagonia, Chile, where he has a woodshop and is a fly-fishing guide. Look for Part II of Seaver Jones’ story on Mah Jong in the January 2018 issue of Soundings.